For years we have been kicking around the idea of vicarious cow protection. Facing the reality that most will have to, for the time being, purchase milk from cows that will be slaughtered, what is a sincere devotee of the Supreme Cowherd Boy, Krishna, to do? The idea is that if someone has to buy Putana milk, they can purify it by contributing to cow protection programs. We have roughly calculated that it costs about $10-12 in the US to produce a gallon of milk where the cow shall be given life time protection. Compare that to the $3 slaughtered cowsâ€™ milk would typically go for. The concept is that by paying the differential, or portion thereof. into a cow protection program or endowment fund, the consumer would in effect be consuming protected milk vicariously. A cow is protected and milk is available. Whole Foods has applied this concept to wind generated electricity. 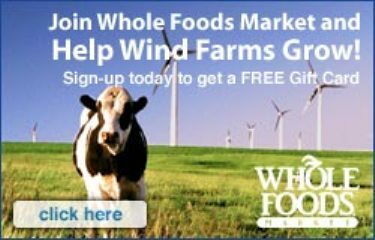 â€œLOS ANGELES, Nov 1 (Reuters) – Top U.S. natural and organic foods retailer Whole Foods Market (WFMI.O: Quote, Profile , Research) on Wednesday began selling “wind-power cards” that seek to fund and market the growing renewable energy. â€œSeventy-six Whole Foods stores in nine states will offer $5 and $15 plastic cards that are to represent the average electricity use by a person – 250 kilowatt hours – and an average household — 750 KWh – in the United States per month. â€œRenewable Choice Energy will collect money from the sale of the cards and use it to market wind power produced by its clients, which are U.S. wind power producers that sell to utilities on the open power market, said Ted Rose, director of business development for Renewable Choice Energy. â€œThe card does not reduce or impact consumers utility bills, nor does it deliver wind power to consumers. Rather, it helps U.S. wind-power producers market their product. â€œ “This is for consumers who want to ensure they are paying for clean energy” rather than electricity produced by using fossil fuels like natural gas and coal, said Rose, who offered no projections on how the card will sell. â€œRose said the $5 per individual and $15 per household is in line with the increased costs of producing and marketing wind power in North America over the costs or producing power from plants that run on fossil fuels like coal, oil, and natural gas. â€œIn January, Whole Foods announced the largest corporate purchase of renewable energy credits in North America to offset all of its electricity use. I would gladly pay 10-12 dollars for a gallon of milk produced under Vaishnava supervision and with no taint of slaughtering Go-Mata. Every temple should buy an amount for all prasadam and abhishekam! This is truly a model for sustainable Vedic agriculture. If it matters where the bhog comes from (it does) then we should all step up and prove it.